Museum Village - Are We There Yet? Museum Village offers the opportunity for visitors to see, touch, hear, and understand life in 19th century America. Amongst other exhibits, the Natural History Building features a mastodon called Harry -- one of the three most complete specimens in the world. 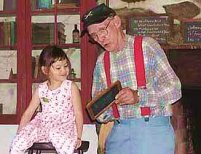 As a non - profit educational institution, Museum Village offers several excellent School Programs for all grades. The newsest offering, The Village Sampler, allows students to experience hands-on learning in staffed buildings. Churning butter, using mortar and pestle, operating an old fashioned printed, and dipping candles are just some of the activities they will enjoy. Hours: Museum Village officially opens to the general public around springtime and closes in early winter. Call for the current schedule or visit the official website, linked above. There may be additional hours for groups with reservations. School Outreach Programs are available throughout the year. Call for details. Children under 4 FREE Special events pricing may vary. Call for details. Call to confirm before visiting. Lunch: Picnic grounds and refreshments available. Directions: I-87 to Exit 16. Route 17 West to Exit 129. Museum Village can be seen from the highway. Follow signs. 1 hour 15 min.